Give - Slatington Baptist Church Slatington Baptist Church is a 115-year-old church located at 509 Main Street, Slatington, PA. The Church is led by the Rev. James LeVan. 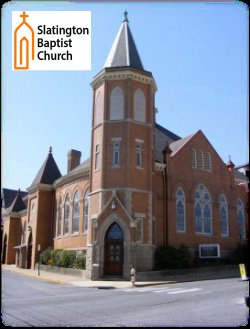 Slatington Baptist Church, like all churches today, is faced with the ongoing challenge of keeping up with the ongoing expenses involved in ministering to our community and congregation with a decreased amount of ongoing monetary contributions, and lower numbers of regular members. We have taken steps to create awareness of our church through community outreach, events, social media exposure, public relations, this website, and more. However, while we work hard to increase our membership, our expenses continue.